So you’ve heard that municipal bond yields & rates can be higher after taxes than other securities with similar risk. Now the question is how much more? 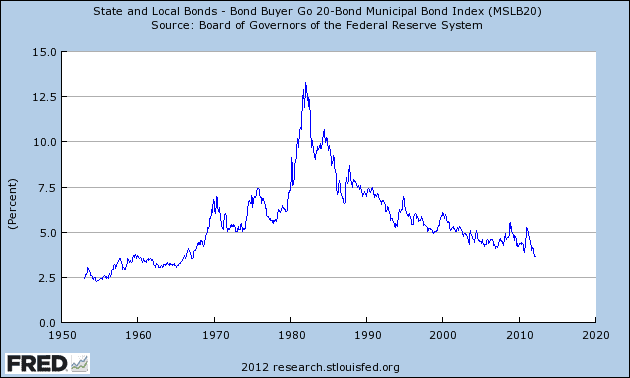 Below you can see a chart of the average yield on a 20 year AA municipal bond, as represented by the Bond buyer Index*. For a list of current municipal bond rates and the yield curve go here. As you can see the interest rate paid on municipal bonds has been falling steadily since the 80’s and the average high investment grade municipal bond is currently yielding a bit over 3%. How much higher are municipal bond yields than similar taxable instruments? US treasury bonds are generally used as the comparison benchmark for all types of bonds, and municipal bonds are no exception. When comparing municipal bond yields to treasuries over longer periods of time (30 years plus), municipal bonds will generally yield around 5 to 10 % less than treasury bonds of a similar maturity. This is true even though treasury bonds are considered safer than municipal bonds. The reason why municipal bond yields are normally lower is that in addition to being free of state income tax, municipal bonds are also free from federal income taxes. After taking into account the tax benefit, municipal bonds have yielded around, on a historical basis, 25 to 30% more than US treasuries of similar maturities, partially reflecting the additional risk involved. For more on how to find out whether a municipal bond is tax free go here. How do municipal bond yields compare to treasury yields? As you can see from the chart below, we are currently in a unique situation where Municipal Bonds are yielding more than treasuries, even without taking into account the tax benefit. 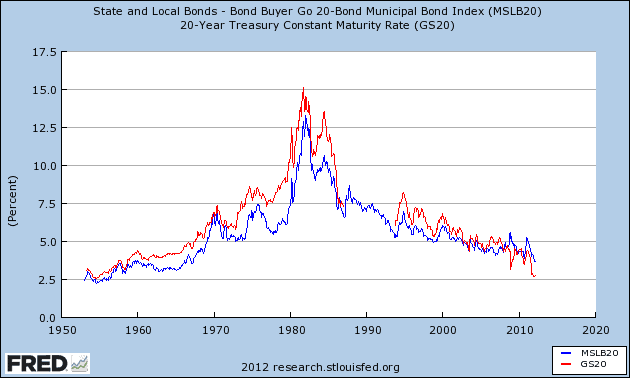 At the time this article is being written (March 2012) municipal bond yields are about 5 to 10% more than treasuries. While there are some temporary factors which are depressing treasury yields (global economic uncertainty and the FED trying to keep rates low), there is one factor specific to municipal bonds that has lead rates higher than historical averages: Fear of Municipal Defaults. In the middle of December of 2010, Wall Street analyst Meredith Whitney predicted billions of dollars of defaults on the popular TV show “60 Minutes”. Following that Interview, the yield on municipal bonds shot up in relation to Treasury bond Yields. Because of the tax benefits associated with owning Municipal Bonds, primarily US individual investors (or bond funds catering to those investors) buy municipal bonds. This is very different from treasuries or corporate bonds, where it is primarily institutional investors from all over the world that drive demand. As the individual investor is much more likely to be “spooked” out of the market than institutional investors, Municipal bond yields are affected by retail investor sentiment and demand to a greater extent than other types of bonds. Because of this demand for municipal bonds over the short-run, and the price movements that result, can significantly diverge from other types of bonds. The supply of municipal bonds is also very different than other types of bonds. While low interest rates and the ability to issue debt “cheaply” does affect issuance, other factors play a greater role. Politics, the willingness of the public to engage in new municipal projects, and local finances have a much greater affect on new supply. This can also cause price divergence in relation to corporate bonds, where low interest rate environments alone can cause corporations to issue new debt at a much faster pace. In the beginning of 2012, supply for municipal bonds was very limited because municipalities were cutting expenses and not initiating new projects. As a result of the low supply, yields dropped (prices went higher reflecting the decrease in supply). Because of this professional municipal bond buyers pay close attention to visible supply, the pipeline of new municipal issues which you can view as well here. *The number of municipal bond issues is staggering. A large municipality like New York City can have hundreds of outstanding issues. The number of issues and infrequency with which bonds trade make finding the “current” market price and yield for a specific bond very difficult. However, if you want a general directional benchmark to be able follow the trend in yields, we recommend looking at the Bond-Buyer Bond Buyer – 20 Bond Index which we have displayed in the charts towards the beginning of this article. To create this index, Bond Buyer calls up major dealers and gets price quotes from them. The 20 bonds in the index have an average maturity of 20 years and AA credit rating.